Emiralem located in Gediz river basin which is having a significant agricultural potential is a county familiar with strawberry production. The fact that production style in the basis of yield associated with careless fertilizer use gave rise to soil, water and air pollution has become a threat to the environment. This study aims at describing the current circumstances on probable jeopardies toward human health and environmental pollution and examines the producer behaviors in order to increase the production potential of the region. For this purpose a survey of 67 producers covering 150 structured questions was carried out in the area. The data was analyzed via some descriptive statistical analysis techniques and particularly Analytical Hierarchy Process. The analysis depicted that the producers were seeking both quality and quantity during the strawberry production. It is also deduced that the farmers should be trained for sensitive production applications to environment via extension services. Ağaoğlu, Y.S. 1986. Berry Fruits, Ankara University Faculty of Agriculture, Publication No: 984, (Üzümsü Meyveler, Ankara Üniversitesi Ziraat Fakültesi, Yayın No: 984) Ankara. Anonymous, 1993. Soil Survey Manual, Soil Survey Division Staff. United States Department of Agriculture, Handbook No:18, U.S. Goverment Printing Office, Washington, D.C, USA. pages 410. Anonymous, 2008. Governorship of İzmir, Provincial Environmental and Forest Directorate. Studies of Gediz Basin. Anonymous, 2013. Turkısh Statistical Instıtute, Crop Production Statistics Database, Republic of Turkey Ministry of Food, Agriculture and Livestock (Date accessed: 25.04.2013). Bayram, S.E. Determination of the process of plant nutrient uptake in strawberry (Fragaria sp.) plants at various stages of development, Ege University Graduate School of Natural and Applied Science, Doctorate Thesis, (Unpublished). (Çilek Bitkisinin Farklı Gelişim Dönemlerinde Bitki Besin Maddesi Alınım Seyrinin Belirlenmesi, Ege Üniversitesi Fen Bilimleri Enstütüsü, Doktora Tezi), (Basılmamış). Çakici, H., Aydin, Ş. 2005. Nutritional Status of Strawberry Plantations in Emiralem- E.U. 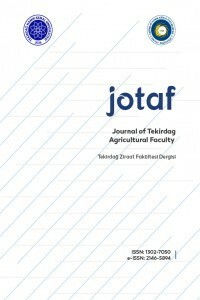 Faculty of Agriculture - Electronic Journal, 42(1): 155-166. Miran, B. 2002. Basic Statistics (Temel İstataistik). Öner, Ö., Çelik, A. 2011. Investigation of Some Pollution Parameters in Water and Sediment Samples Collected From the Lower Gediz River Basin, Ekoloji 20, 78, 48-52 . Özden, A., Ayanoğlu, H. 2002. Nutritional Status of Strawberry Plantings Near Silifke in Turkey. Acta Hort. (ISHS) 567:443-446. Saaty, T.L. 1980. The Analytic Hierarchy Process: Planning, Priority Setting, Resource Allocation. McGraw-Hill, New York. Üstün, G.E. 2011. The Assessment of Heavy Metal Contamination in the Waters of the Nilufer Stream in Bursa. Ekoloji 20, 81, 61-66. ISNAD ERDOĞAN BAYRAM, Seda , ELMACI, Ömer , MİRAN, Bülent . "An Evaluation Of Strawberry Production In Terms Of Plant Nutrition And Farmer Applications: Evidences From Gediz River Basin, Turkey". Tekirdağ Ziraat Fakültesi Dergisi 13 / 1 (January 2016): 66-79.